How to maintain Indian marble & remove scratches & stains from surfaces? Marble is a metamorphic rock that consists of re-crystallized carbonate minerals with the most common ones being calcite or dolomite. It is a beautiful natural stone that occur in numerous shades and patterns. In the construction sector, marble is mostly used to create floor tiles, countertops and furniture. Although marble is a durable material, it contains several impurities that are responsible for some amazing shades and patterns on its surface and also make the marble comparatively softer. For these very reasons, marble can be easily etched, dulled or stained. Therefore, to preserve its shine or appearance and to ensure its longevity; proper and timely maintenance is required. The maintenance of Indian marble can be broadly divided into three categories, viz., basic maintenance, stain removal and scratch removal. Continue reading to learn about these methods in detail. Protection from Scratches: Don’t let any sharp-edge objects to come in direct contact with marble. For marble floors, padding can be done under the legs of chairs and tables. 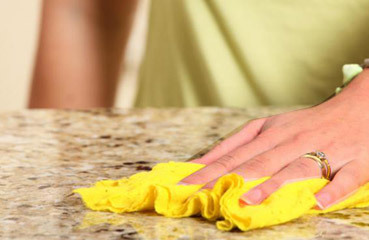 In case of marble countertops, mats or coasters can be used to protect the same from appliances and glass objects. Frequent Cleaning of Marble: This natural stone gets easily stained, particularly when a liquid is left untouched for a longer period of time. It is therefore suggested that, if an alcoholic or non-alcoholic beverage spills over the surface of Indian marble, it should be immediately removed or cleaned. Stuffs with strong pigments, such as curry powder, leafy greens and coffee grounds should be wiped instantly. Wiping Marble with a Moist Cloth: A soft piece of cloth moistened with lukewarm water is recommended to clean small spills and dust from the marble surface. Avoid scrubbing as it may lead to scratches. Make circular motions surrounding the area of the spill with a little pressure to clean the surface. Keeping the Marble Dry: Never leave water on the marble surface even after you finish cleaning marble floor or countertop, as this may cause stains to occur on the surface. Delicately rub the wet area using a dry soft cloth after cleaning the surface with a damp cloth. Using a Mild Soap, Natural Material or Recommended Marble Cleaner: To clean debris or dust from a marble floor or countertop, a diluted solution of dish soap in lightly warm water works well. A soft cloth should be used for the cleaning purpose. Although vinegar is a great natural cleaning agent, its acidic nature can cause damage to Indian marble, hence shouldn’t be applied. Hydrogen peroxide is a suitable cleaning agent for light shaded marbles. Shining the Marble with Chamois Cloth: Made from soft fabrics, chamois cloth can be used to dry and shine the marble surface. Commercially available marble polish is also a great option, but before using the same, make sure that the polish is exclusive for marble and not apparently meant for granite or other natural stones. This is because of the fact that marble is unique in terms of its composition and a harsh chemical can bring damage to its surface. Spraying Water at the Stained Area: The stained area and its vicinity should be sprayed well with water. Applying a Poultice: Prepare a thick paste of baking soda using water and apply it directly on the stain. Thereafter, cover the stained area with a small plastic sheet and let it untouched for the next 24 hours. Note: A poultice can also be made using a mixture of flour and non-abrasive dish soap. Removing the Poultice: Uplift the plastic wrap and use a soft, moist cloth to remove the poultice. Repeat the process to remove the left over poultice, if required. Using Hydrogen Peroxide: Apply a little hydrogen peroxide over the stain and cover it with a plastic sheet. This is also required to be left for the next 24 hours. After this, remove the plastic wrap and gently remove the hydrogen peroxide using a damp cloth. If required, repeat the process. Note: In case the marble is dark in color, be careful while using hydrogen peroxide as this may discolor its surface. Using Corn Starch on Grease Spots: Spread a little corn starch on the grease spot and let it absorb the grease for nearly 20 minutes. Further, wiping away the corn starch with a moist cloth will remove the spot. Begin with Gentle Cleaning: Using lukewarm water, rub a soft cloth against the scratch to remove it. Mild dish soap can be used to create a bit of friction in the process. Make sure to wipe out all the soap water from the surface and let it dry after rubbing. Using Finely grained Sandpaper: To remove deep scratches, gently rub the scratch with fine-grain sandpaper. Avoid using coarse-grain sandpaper as it might create tiny dents or cavities on the surface. Consulting a Professional: If the above two methods fail, it is better to hire an expert instead of causing further damage to the marble. Professionals have appropriate experience and equipment with which they can easily remove the scratch from a marble floor or countertop without causing any harm. Aging and weathering are natural phenomena that are sure to occur in case of every natural stone. Sadly, one can’t cease them completely, but the good news is that these phenomena can be delayed with proper care and maintenance. These in turn would keep the marble floor or countertop to shine like a new for decades. ← Regatta — Where Quality Comes First; Always..! !